I look at my phone and read the text messages, all sent within 10 minutes. My pride swells and my ego can’t help but praise itself on a job well done. 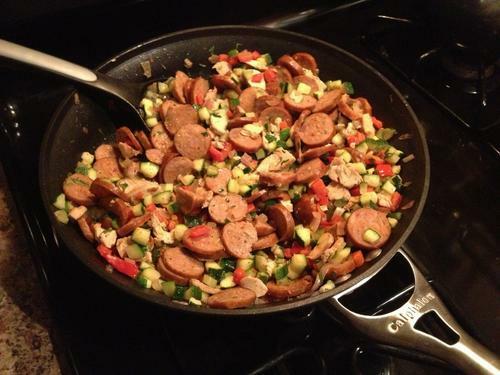 My fiance has tried my chorizo zucchini hash for the first time. She knows a thing or two about behavior modification and stroking my ego like this means she’ll be getting this lunch again very soon. Who doesn’t love praise? This chorizo zucchini hash is a healthy lunch option that follows all the rules of the slow-carb diet. We’ll have to pace ourselves here, lest we burn out our favorite lunch dish so far. This one was easy to make and gives you a lot of variety options after you make it the first time. You’ll begin to find different meats and vegetables you can switch out. Part of this dish’s inspiration came from my love of zucchini and the other from the fact that we still had leftover chicken breast from my bulk cooking session a week earlier. Add in the zucchini and red pepper. Add more fat/butter/oil if needed. Saute 2-3 minutes. You don’t want this mix to get mushy, so I warn you against going over on these times. Add in your protein and season with S&P. Turn off the heat and stir in your cilantro. My taste-buds are strangely sensitive to cilantro, so I only add a little. We got 4 total servings out of this. We ate it as lunch this Monday and Tuesday. May be back in the rotation as early as next week! Michele and I are waiting to cite our body composition changes. It’s way too early in the game to see what sort of consistent results we have out of this. Once we notice any sort of steady or strong trend with our bodies, we’ll let you know about it. I’ll say this much: things have gone really well so far. Hoping that continues. The weight loss is going well for me so far and I expect to have no trouble making weight for the tournament. After our first “re-feed” day, it’s much easier to resist cravings. I can stay strong knowing that I can have whatever my stomach desires this coming Saturday. I never got my hamburger last re-feed day, so that’s at the top of my list. With that said, I’m enjoying eating strictly healthy six days a week. There are several different healthy diets, and Michele and I will only follow this one for a few months. The simple reason is that we enjoy variety and the many different ways we can enjoy life and be responsible about our health at the same time. In time, with experimentation, we’ll find exactly what works for each of us. This diet has a singular design, to help people lose weight. And from all my experiences with the slow-carb diet, it does just that.